The recent IRS ruling allowing employers to make retirement plan contributions for participants who are repaying student loans even though they are not contributing to the employer’s 401(k) plan has received a lot of attention. Unfortunately, most of the attention has been from employers who want to continue to offer matching contributions and to make exceptions for participants with student loan debt, when the real focus should be on why employers want to continue to offer matching contributions at all. Rulings like this highlight the fact that many employers have not recently evaluated why they offer a retirement plan and the ideal design of the plan. A little history may help. When 401(k) plans were first approved in the 1980’s, employers generally needed to offer a matching contribution, because most employees also participated in a defined benefit pension plan that provided decent retirement benefits, especially after taking into account Social Security benefits beginning at age 65. Employees were totally unfamiliar with the concept of saving for their own retirement and needed the incentive of a matching contribution to get them to do so. In addition, since 401(k) plans were new, plan assets were very small and employers wanted to increase plan assets quickly in order to bring down the administrative costs of the plan (or at least reduce cost as a percentage of plan assets). But, 35 years later, with defined benefit plans almost nonexistent and Social Security benefit cuts almost no employees are unaware of the importance of saving for retirement themselves and the drawbacks of matching contributions now outweigh the benefits. Not surprisingly, the large recordkeepers and financial advisors for plans continue to encourage matching contributions, especially when they are compensated on a percentage of plan assets, since increased plan contributions increase their compensation. But, the recent IRS ruling described above should remind employers that matching contributions reward participants for contributing to the employer’s 401(k) plan even when there are better and more important things for employees to do with their money. Paying off high interest student loan debt is just one of many good reasons for participants not to contribute to their employer’s retirement plan. Some of the others are: unreimbursed medical expenses of their own or a family member, high interest credit card debt, the availability of better retirement savings options, like a health savings account (HSA) and the inability of lower paid employees to meet basic living expenses. So does it really make sense to provide an exception for employees with student loan debt and not an exception for employees for these other valid reasons for not contributing? 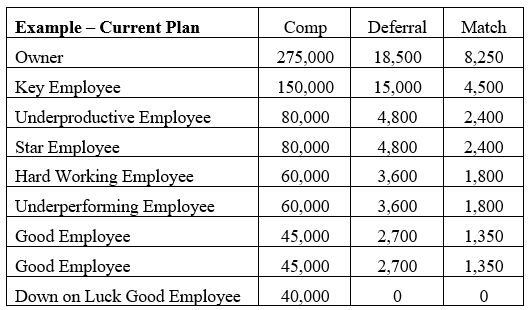 And if the purpose of the plan is to help enable employees to be able to retire someday, why would the employer not want to contribute for these other deserving employees? If the employer paid a bonus to its employees, would it only pay them to those employees who could show that they could match the bonus? I hope not. So, is there a better way for employers to help their employees save for retirement without the drawbacks of matching contributions? Fortunately, there absolutely is! Ever since the IRS approved (a few years ago) plan language allowing employers to allocate employer non-elective contributions on an individual basis, non-elective contributions have a clear advantage over matching contributions. Employers can generally choose who gets a contribution and the amount of the contribution may be based on job performance (individual, company or a combination of the two) or other criteria irrespective of whether the employee contributes to the employer’s retirement plan. In addition, the criteria for receiving a contribution and the amount of the contribution does not need to be described in the plan, and may change from year to year without having to make any change to the plan document. This also has the advantage of enabling the employer to make much larger contributions for highly compensated employees and still satisfy the nondiscrimination requirements of the Internal Revenue Code. Employers can and should also add an automatic contribution and automatic increase provision to their plan to eliminate any concerns that replacing their match with a non-elective contribution will cause an average deferral percentage test failure. The automatic contribution and automatic increase feature also sends the message to the employees that they should be contributing 10% or more of their compensation for retirement each year without penalizing those who can’t or who are better off contributing their money to another investment vehicle (like an HSA). The examples below show how a non-elective contribution with automatic contributions and automatic increases almost always results in a better retirement plan for both the employer and employee than a plan with matching contributions, without the need for a special IRS ruling to proceed. Now that is a true match made in heaven.